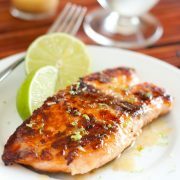 You can’t go wrong here with this simple island style Pan Seared Salmon with Sweet and Sour Sauce! It’s quick and easy and perfectly delicious! 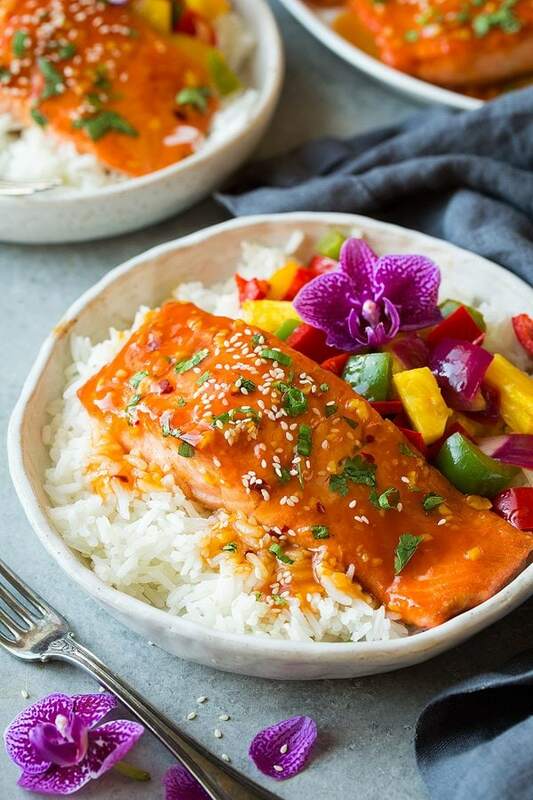 Serve this sweet salmon dish with rice and a side of sauteed peppers, onions and fresh pineapple and you’ve got a meal people won’t forget. 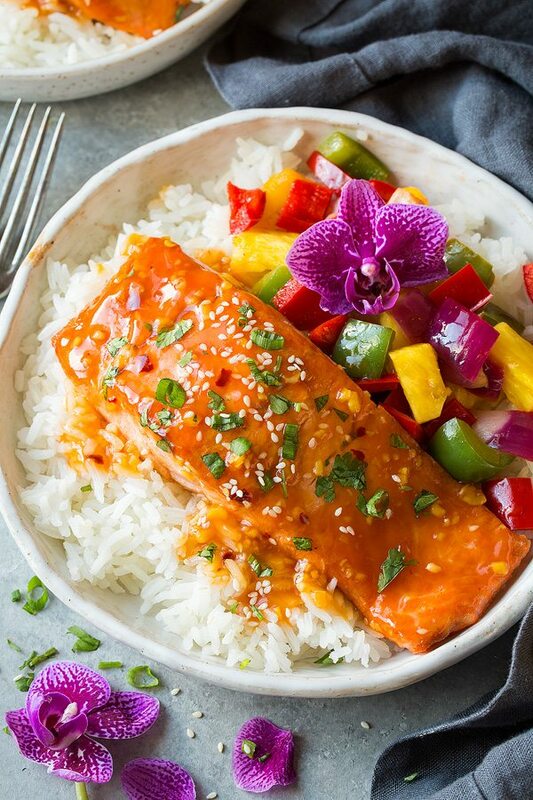 I’m loving skillet salmon lately, it has the perfect combination of sweet and sour flavor. 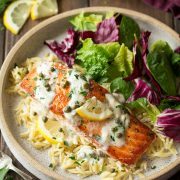 And that crispy crust you get on the exterior of the salmon is just dreamy, not to mention it’s one of the quickest ways to cook salmon. I actually made this salmon last week and I’m making it again tonight for dinner because we all loved it so much! Winner winner salmon dinner. I love how easy it is, and don’t even get me started on that sweet and sour sauce! 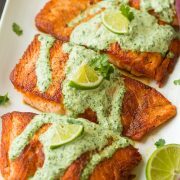 It has the perfect balance of sweet and tart, it’s the perfect consistency and it highlights the salmon perfectly. And bonus you can also use this sauce recipe for grilled chicken or coated and fried chicken pieces. If you really love sauce and you want more for veggies and rice I’d recommend doubling the recipe. In a bowl whisk together cornstarch and soy sauce (the cornstarch is what will thicken up the sauce). Mix in soy sauce, pineapple juice, honey and brown sugar. Also mix in rice vinegar, ketchup and red pepper flakes. Then heat a little oil in a skillet and lightly saute garlic and ginger. Pour in the sauce mixture and let it thicken up and know you’ve got an incredibly delicious homemade sweet and sour sauce. This sauce isn’t just for salmon. It goes great with chicken too. Little battered and fried pieces of chicken (using the same method as my Chinese Orange Chicken) or grilled chicken breasts or thighs are great options. It just snowed outside, for like the 50th time this winter (okay maybe 20th, I tend to exaggerate sometimes), so instead of dreading the cold I’m just sitting inside in the warmth and eating this island inspired salmon and pretending I’m somewhere tropical, and then I’ll finish it off with some hot cocoa. As a side note if you don’t want to buy one of those really big cans of pineapple juice because you don’t want to drink the extra, then just buy the mini cans or use the juice from a can of chunk pineapple or pineapple slices and serve the pineapple with the salmon. Or even use just a portion of a can of the frozen pineapple juice concentrate (& reconstitute the portion you use) and reserve the rest to make this again another time. Happy cooking, and of course happy eating! 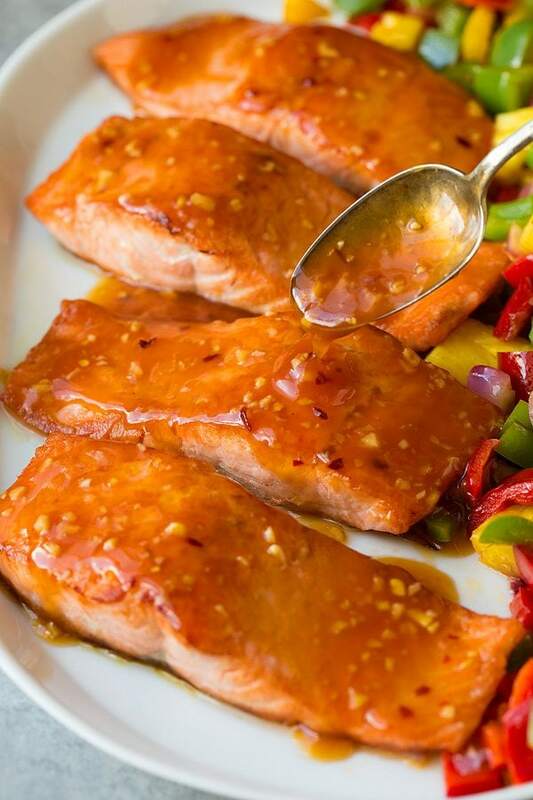 Salmon fillets are seared to golden brown perfection then covered with an easy, homemade sweet and sour sauce. 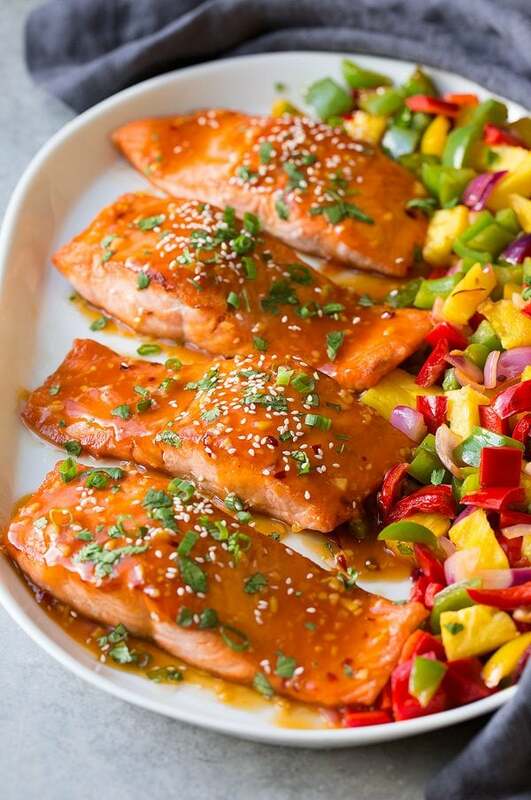 We all love sweet and sour chicken but now is the time to try that flavor combo on salmon. It's so delicious! Remove salmon from refrigerator and let rest at room temperature for 10 minutes. Meanwhile prepare sweet and sour sauce. 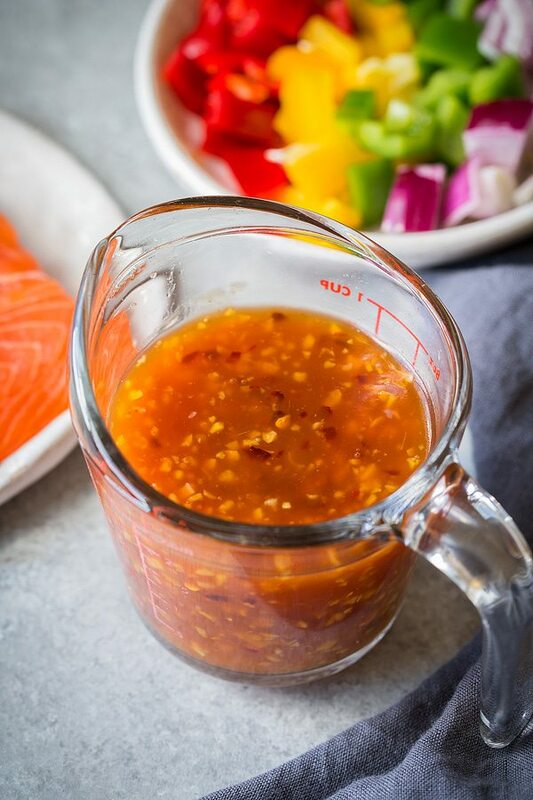 For the sauce, in a small bowl whisk together cornstarch and soy sauce, add in pineapple juice, honey, brown sugar, rice vinegar, ketchup and red pepper flakes. Heat 1 1/2 tsp of the oil in small saucepan over medium heat, add ginger and garlic and saute until lightly golden brown, about 30 seconds - 1 minute. Whisk pineapple juice mixture once more then pour into saucepan. Bring mixture to a boil stirring constantly, then allow to boil, stirring constantly until thickened, 1 minute. Dab both sides of salmon dry with paper towels, season both sides with salt (use about a heaping 1/2 tsp total). Heat remaining 2 tsp oil in a (heavy) 12-inch non-stick skillet over medium-high heat. 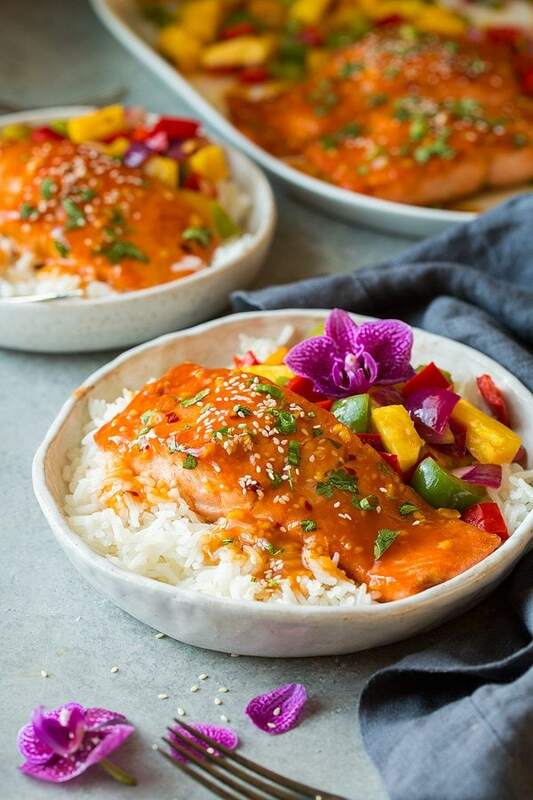 Plate salmon, spoon sweet and sour sauce over salmon, sprinkle with green onions or cilantro, and sprinkle with sesame seeds. Serve immediately. Paige Flamm: Oh yum! I love sweet and sour salmon! This is awesome dinner inspiration for tonight!